When all is said and done, Montenegro did offer England a greater test than Czech Republic. The hosts did manage to score but then, like the Czechs, conceded five without reply. This is the first time that England have scored five in successive games in over 30 years. England were far superior here and the confidence, goals and victories keep flowing as they head to the Uefa Nations League finals in the summer in fine form. Although England did not reach the heights of skill and tenacity of their last match, they showed composure and conviction to come from behind and come through a nasty evening with a testing atmosphere. Having put in such a great display on Friday evening at Wembley, one would not begrudge Gareth Southgate from sticking with the eleven he selected then. However, the England manager was keen to freshen things up and acknowledged the amount of football that Jadon Sancho and Ben Chilwell have wracked up of late. Southgate made four changes and gave first England starts to Declan Rice and Callum Hudson-Odoi, both of whom impressed when coming on against the Czech Republic. Ross Barkley and Danny Rose also both came in for Chilwell and Jordon Henderson. The Liverpool captain did come on as a second-half substitute to make his 50th appearance for his country eight years after his debut. And yet despite the changes, England started assured and with what seemed like relentless possession. It felt like one could count the number of passes that Montenegro mustered on one hand, such was their acceptance in allowing their visitors the ball. Sat in a compact shape, with two narrow banks of four, the hosts aimed to frustrate England by cutting off passing channels. Thus the surprise that whipped around the City stadium when Montenegro took a shock lead on 17 minutes was noticeable. It was a neat finish by Marko Vesovic who curled a shot beyond the outstretched Jordan Pickford following some slack England defending. What was even more surprising was how the hosts looked to push on further having taken the lead. Whether England were shocked or not to be a goal down after utterly dominating the early period of the match, they struggled to regain a grip on proceedings. Their pace slowed and, as seen in the first 20 minutes on Friday, England need to play with tempo to break down the more obdurate opponents which they face. 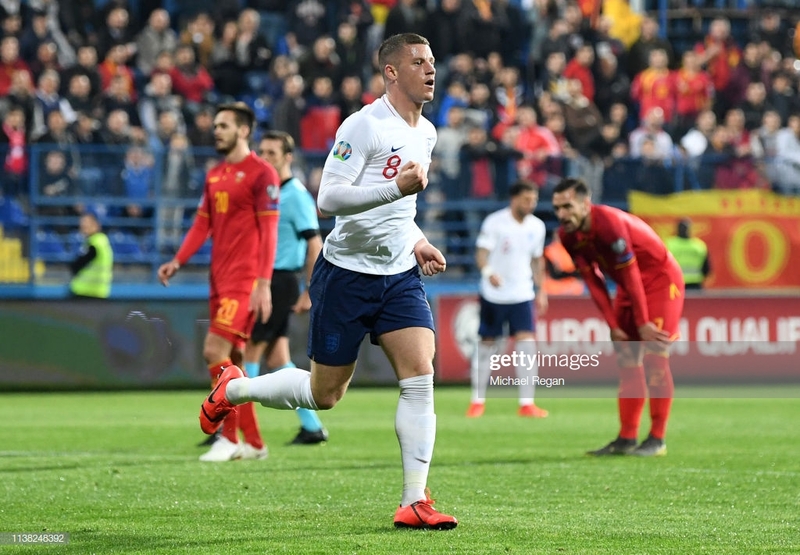 Michael Keane may well have held his hand up for his rather nonchalant defending in the build-up to Montenegro’s goal, but his headed equaliser on the half-hour mark certainly got England back on track. This was Keane’s first goal in an England shirt on what was his seventh appearance. It was former Everton player to current Everton player, as Barkley was the deliverer of the inviting cross which was asking to be headed home by Keane. The goal settled any nerves that may have begun to emerge. Barkley was impressive when he came off the bench early against the Czechs and, despite starting rather slowly, the Chelsea midfielder grew into the game here. After providing an assist, he scored England’s 2nd and 3rd goals with a one-touch flick and a low shot in what was his best evening for his country. The match was from then on under England’s control and Barkley seemed to relish the free reign that Southgate had given him on the inside-right channel. Central midfield is sighted as the area in which England are weakest but with Barkley and Rice controlling and creating to such a degree, Southgate will take plenty of positives from their performances. One downer on England’s victory was the racist chants that greeted the visitor’s black players when they were on the ball. Rose and Sterling both suffered abuse whilst a lighter was thrown towards Hudson-Odoi, who picked it up, passed it to the England bench and they gave it to the Uefa delegate. When Sterling scored England’s 5th in the final 10 minutes, he cupped his ears in reaction to the horrific chants which he had to endure during the match. Uefa must take action, there has to be repercussions to Montenegro’s self-proclaimed ‘hellish atmosphere’. England were hellishly good and, from a footballing perspective, that’s what mattered.